What you need to know to enjoy the summer with your pet. 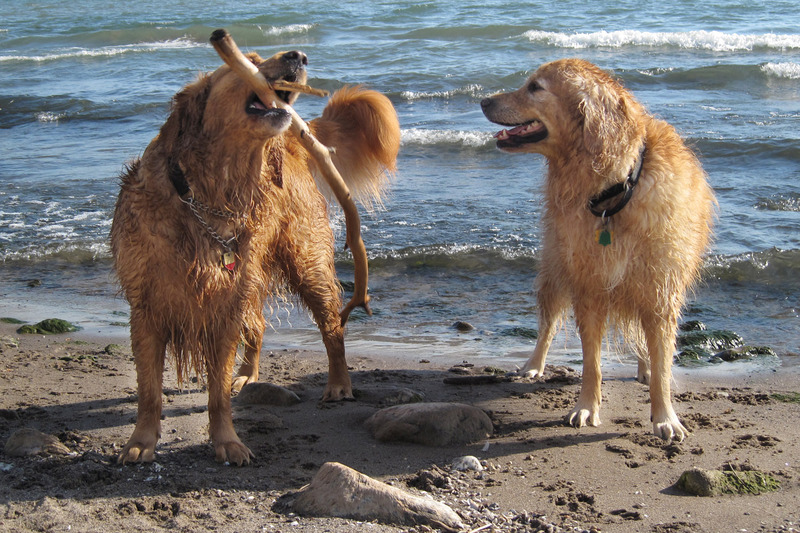 Home » What you need to know to enjoy the summer with your pet. Summer is here and the weather is hot in Pickering Ontario. That means fun in the sun. Hot weather does pose risks for our animal friends. With proper precautions you and your pet will enjoy a fun, comfortable and healthy summer. Please stay safe. Here are some tips from our veterinary staff at Amberlea Animal Hospital and our veterinarian Dr. Fulop. 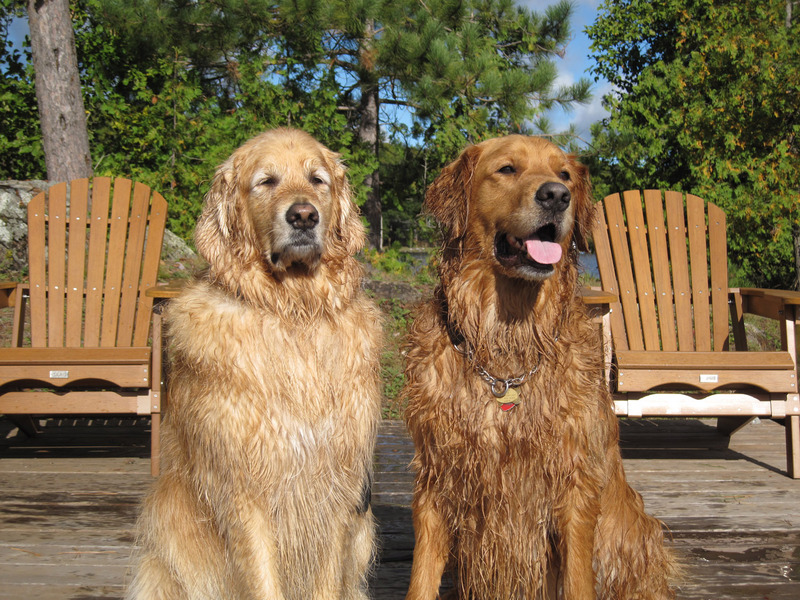 My Yukon and Charley at the cottage staying cool by swimming in the lake. Make sure you and your pet have plenty of water available on these hot days and offer them something to drink every half hour. A rule of thumb is 1/8th cup of water per pound of body weight, but they will require more than this on a hot day. However, do not let your dog drink a lot of water before, during or after exercise because a condition called bloat or gastric torsion may result. Your dog can die from this. Because dogs don’t wear running shoes, they need pad protection. Your dog can get damaged or blistered feet if it doesn’t have time to build up its foot pads. Consider walking/running on roadside or grass. Especially the light coated or white pets. Areas of concern are the nose, face, ears and belly especially if they lay on their backs when sleeping, like my Yukon does. 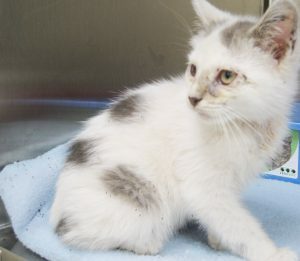 There are some pet safe sunscreens available but be careful -there are some ingredients that can be toxic to your cat. Always consult with your veterinarian before purchasing anything for your pet. Do not use human sunscreens on your pet. The flea population rises as the temperatures rise. Flea control is important for several reasons. Flea bites can cause local skin irritation and swelling that may cause your pet discomfort. Some dogs and cats will develop an allergic reaction to flea bites and this intense irritation may result in constant scratching, which can lead to hair loss or a bacterial skin infection known as “hot spots.” Fleas are also intermediate hosts for tapeworms and can transmit bacteria, viruses, and protozoa. Kitten treated for fleas at our veterinary clinic. Enlarge photo -- The black specks on the kitten and blanket are dead fleas. Improper use or application of flea and tick control products is a common cause of pet poisoning in the summer months. Use such products responsibly and according to package instructions. Overuse and misuse can be deadly. Never apply 45-65% permethrin “spot-on” products to cats, even in small amounts. Highly concentrated permethrin can be extremely toxic to cats. If you have both dogs and cats in your household, you should be aware that using a permethrin “spot-on” product on a dog may cause illness or death in a household cat. It is important to use only flea and tick products specifically designed for cats, and to administer the proper dosage. Never use flea medications intended for a dog on a cat instead. All flea and tick “spot-on” products—even ones with nearly identical brand names—are not alike. Always consult with your veterinarian before purchasing any over the counter product. Never use bug products meant for humans on pets. Ingredients such as DEET in mosquito repellant can be toxic, especially to cats. Only use products formulated for animals on your pets. Consult with your veterinarian for recommendations. Mosquitoes are the vectors for Heartworm disease. Make sure your pet, even strictly indoor ones, are on their heartworm prevention during the appropriate times of the year. Again, consult with your veterinarian. 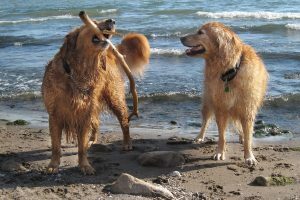 My Yukon and Charley playing in the lake in Pickering. When temperatures exceed 95 degrees (35C) – stay indoors. Use caution when exercising your dogs. Try walking early in the morning or late at night when the temperatures and humidity levels are lower. Don’t forget to carry fresh water for you and your pet. 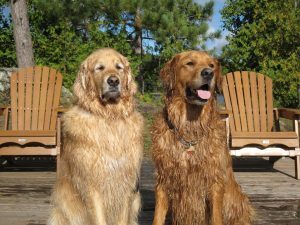 Most dogs can tolerate half an hour of exercise when temperatures are around 85 (29C) degrees but be careful and watch them for signs of heatstroke, as discussed in a previous blog. Wishing you the best, Dr. Kathleen Fulop.